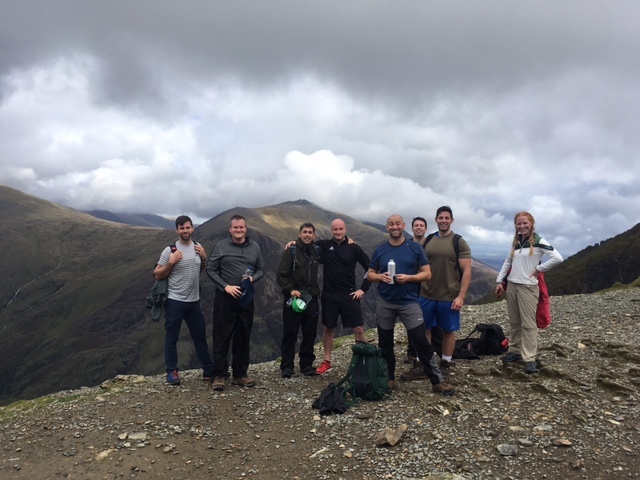 PEP vs Snowdon – We did it! 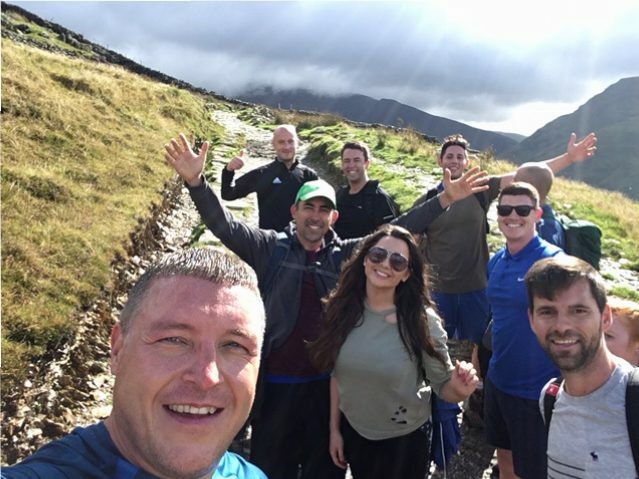 PEP took on the challenge of climbing Mount Snowdon for Macmillan Cancer Support. 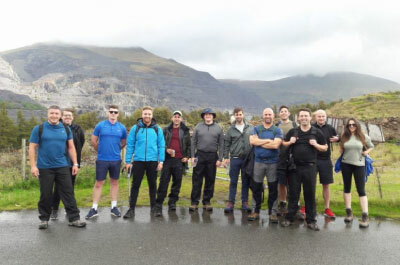 After much anticipation and preparation (and having spent a small fortune collectively in Sports Direct the day before – the phase ‘all the gear and no idea’ springs to mind), we set out from the office on Friday morning, reaching the base of the highest mountain in Wales early afternoon, ready to start our ascent. The weather forecast was sketchy to say the least, as was the clothing some of the team had decided to wear. 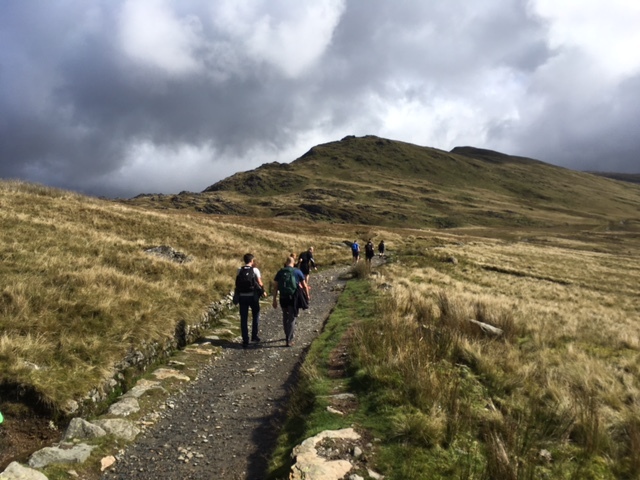 If you’ve tackled Snowdon before you’ll know that it starts with a killer climb up a tarmac road to the start of the Llanberis path. We had been given a strict itinerary that dictated we should meet at 12.15pm in the railway car park. 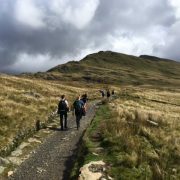 Due to the fact that several members of the team didn’t seem to be able to follow their sat navs, and therefore arrived late, we set off at a fierce pace, which proved too much for a few members of the team who retreated swiftly back down to the pub. 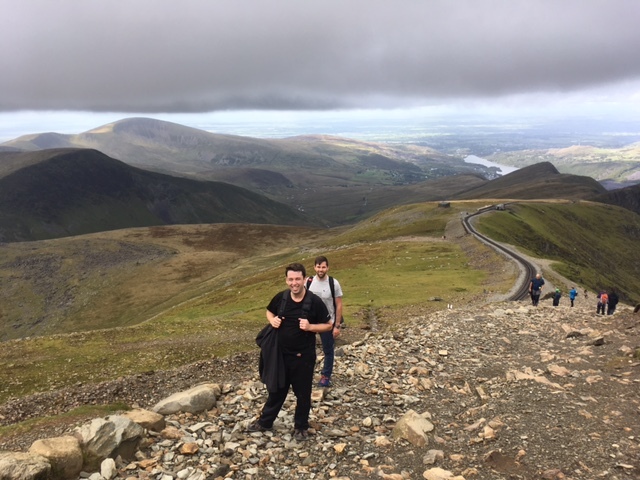 The ascent to the summit at 1085m above sea level was long and tough and the giddy mood of the morning was quickly replaced by determination, pained expressions and lots of cursing Stu, our organiser, for coming up with the idea to climb Snowdon and ever thinking it would be fun. As we climbed higher into the cloud, rain started to fall and the temperature dropped and it was at this point Elle realised she had lost her coat somewhere on the path. Ben took pity on her and gallantly offered his jacket to save her from hypothermia. This was only one of the many heroic acts of the day. 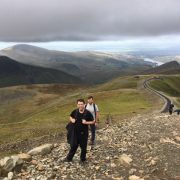 Burned in my memory forever is the image of Gareth tenderly massaging Garry’s crampy legs on the final stretch to enable him to push on to the summit. It wasn’t a pretty sight. 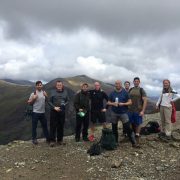 After 2 hours and 30 minutes of relentless climbing, one lost jacket and a serious case of cramp, we finally reached the summit. At the top we were reunited with the deserters who had taken the train. The cloud was so thick, we couldn’t see more than a few feet in front of us so we took shelter in the café, rested our jelly legs and steeled ourselves for the long descent. All except our two Directors Garry and Gav who abandoned their team in favour of a seat on the train! What’s the saying about a captain going down with his ship? The walk back down was long but infinitely easier than the climb and our spirits were high. The well-deserved pint waiting for us at the pub was a huge incentive and undoubtedly quickened our pace. In our weekly ritual, we voted on our Hero and Donkey of the week. Vanessa was unanimously named Hero of the Week for the most determined/stubborn climb. We were not short on nominations for the Donkey award; Steve for not bringing a coat, Phil for throwing in the towel and being the first to retreat after a quarter of a mile and Jay for driving past the meeting point 7 times before joining the group. 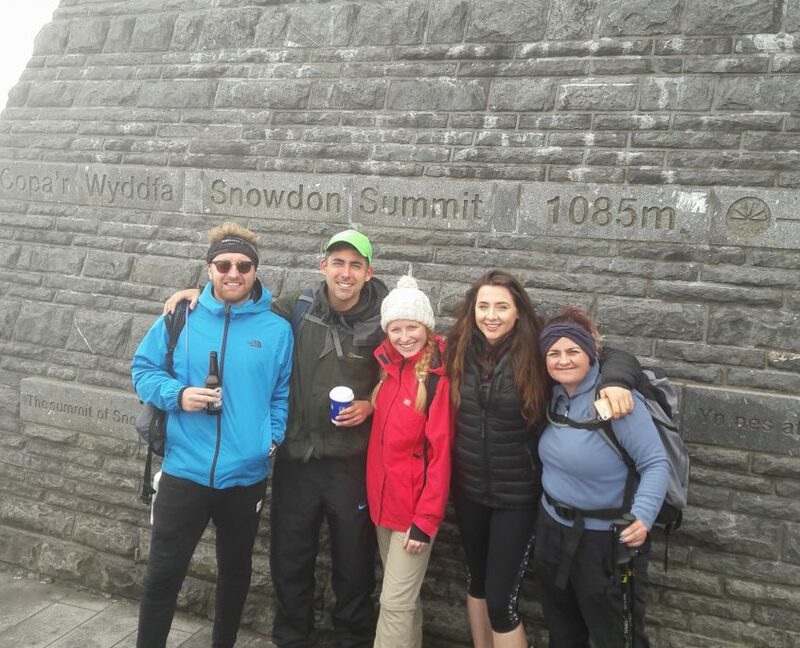 But the award had to go to Elle, not only for losing her coat mid-climb, but also for asking ‘Is Snowdon in Wales?’ Yep – that clinched it, sorry Elle. The accommodation for the night was amazing. Only 15 minutes’ drive from the foot of Snowdon, the lodges were beautiful and set in 60 acres of peaceful wood and farmland – check it out here. However, we descended like a bunch of excitable school kids so the peace was quickly shattered. On the menu for dinner was spag bol and curry thanks to our Directors Garry and Gavin, which went down brilliantly and was just what we needed to refuel for the night ahead. I won’t go into too much detail of the evening’s events, but highlights were the hula hoop masterclass from Sarah and Lindsay, the girls victory in the quiz, Stu and Charlene’s not so graceful fall into the table football and our tuneful (ahem) rendition of Bohemian Rhapsody, caught on camera by Rach. There is definitely something wrong with the sound recording on her phone because it sounded so much better than the video leads you to believe. We smashed our target and raised £615 for Macmillan Cancer Support – thank you to those of you who donated to this fantastic cause. If you would still like to support us it’s not too late! 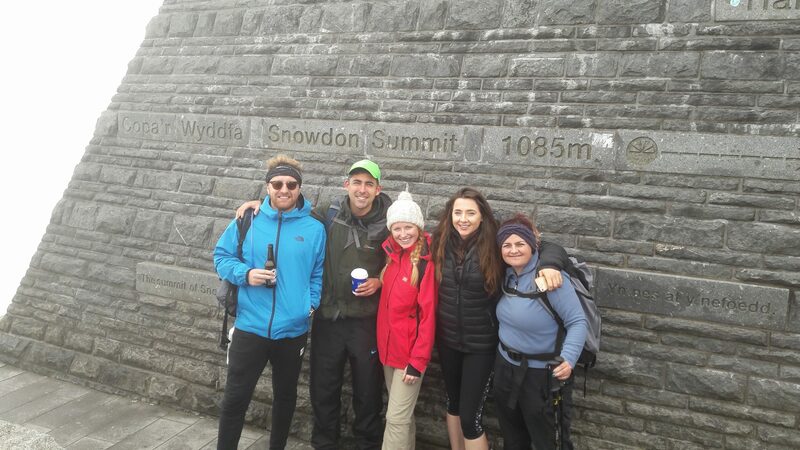 Visit our JustGiving page www.justgiving.com/fundraising/perpetualvssnowdon.